There’s been more information about how to grow churches than any other subject on pastoral ministry in the last 30-40 years. So many small church pastors have felt, or are currently feeling the pressure to do one or the other. Many pastors reading this right now have not been able to pull off the expected growth and are wondering if you should call it quits. At times, that pressure seems to come from everywhere. From our congregations, our denominations and – perhaps the toughest critic of all – within ourselves. Many pastors reading this right now have not been able to pull off the expected growth and are wondering if they should call it quits. If that’s you, don’t quit yet. I have some good news. ‘Grow it or close it’ aren’t your only choices. There’s a third option. And it’s not a weird new method, a mystical ancient secret or a positive thinking, pie-in-the-sky, hope-against-reality dream. It’s been sitting in front of us all along, but a lot of us have been so obsessed with ‘grow it or close it’ we’ve overlooked this alternative. We live in a culture that is so obsessed with a bigger-is-better mindset, that we’ve allowed it to creep into the body of Christ. It’s become such an automatic part of our thought process, that many people in ministry can’t even see this obvious third option for small, struggling churches. Before I go any further, let me be clear about this. When I talk about church health, I don’t mean helping churches become healthy as a stepping-stone to becoming bigger – although it’s great if that happens, too. I mean becoming healthy as an end in itself. So, 80 to 90 percent of the churches in the world are small. That’s not a new phenomenon. It’s been that way for 2,000 years. If the last 50-year push for growth hasn’t changed those percentages, it’s unlikely they’ll ever change. But maybe that’s not a problem. Maybe those percentages haven’t changed because they’re not supposed to. Maybe small churches aren’t bad. Maybe we don’t have a size problem as much as we have a health problem. Imagine if every small church in the world became healthy, strong and vibrant (as many of them are already). Would being small matter any more? If the last 50-year push for individual church growth hasn’t done much to change the percentage of small churches to big ones, Option #1 (grow my church) isn’t likely to happen for the vast majority of churches – at least not past the dreaded 200 barrier (gotta say, I’m not a fan of that term). Does that mean we’re stuck with Option #2? And if so, have we really considered what the unintended consequences of that might be? Are we prepared to say that we need to close 80 to 90 percent of the churches in the world? Another unintended consequence of our size obsession is that many people in ministry don’t know a healthy small church when they see one. Because of a common misunderstanding that ‘all healthy things grow’ means constant numerical increase, there are a lot of people in ministry who don’t think a healthy church will stay small for long. Numerical growth is inevitable, right? If so, any church that does stay small mustn’t be healthy. With that underlying belief, it’s no wonder we haven’t developed adequate tools to help struggling small churches become healthy small churches. We don’t even think it’s possible! We need to challenge our preconceptions about size and health, then assemble and promote the best ideas we can find to help struggling small churches become healthy small churches. How do we do that? 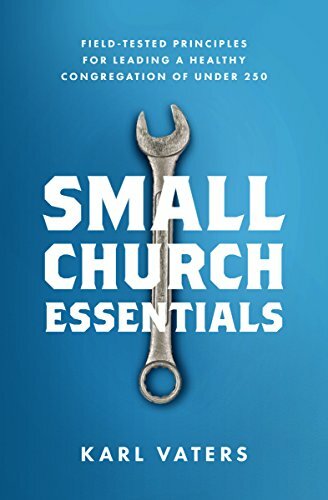 I begin to tackle that in my follow-up post, The Essential First Step to Having a Healthy Small Church.